Fidget spinners are the new stress relief toys that have definitely made their mark in the toy industry. These toys have set most social media platforms on fire. But we can’t deny that spinners have been all over the place for quite a while and you can definitely do a lot of tricks with them. The toy has three blades and a center bearing, and when one of the blades is given a slight push, the spinner starts to rotate. The harder you push the blades, the faster the fidget spinner rotates. Many have found out that this toy has been a major stress buster. And who can blame them, this device not amuse the mind to a great extent? If you are into this spinner toy, and you are bored with only a single type of spinning technique, then check out this compilation of the top 10 fidget spinner tricks that you can try out with your fidget spinner toy. This is the most simple trick of all the tricks mentioned in the list. In the convertible, all you need to do is hold the middle bearing with your thumb and middle finger and then spin the blades. Once the blades start rotating, slowly let go of your thumb balancing the spinner and balance the entire fidget spinner on your middle finger. This is a really simple trick and you will be able to master it after a few attempts so keep trying and master this trick as it is the foundation to many other tricks that are mentioned in the list below. This is a modified version of the convertible and can be a little tricky so be prepared to do it several times in order to perfect this trick. Here, you need to spin the fidget spinner between your middle finger and your thumb and then toss the spinning fidget to the other hand and try to spin it with the middle finger and thumb on the other hand. The trick here is to keep the fidget spinning even after changing the hands and that can take some practice. In the reverse sonic you need to hold on to one of the three blades with your thumb and your index fingers and then rotate the blades of s the fidget spinner up in the air and catch the middle bearing with your thumb and index finger of the same hand. Keep in mind to keep the fidget spinner rotating the entire time. This is a little difficult and it might take a few attempts before you get this one right, however, it looks amazing once you get the trick right. In the polarity switch, you need to get the fidget spinner started by again holding the middle bearing like you did in all the other tricks. 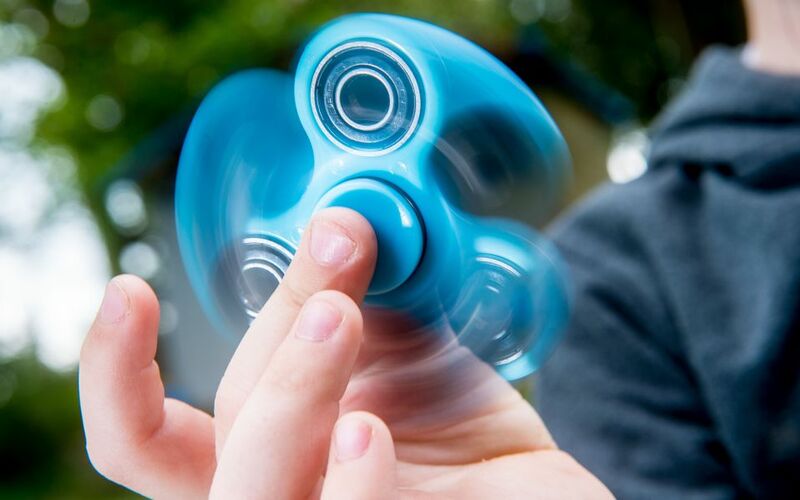 Now once it starts rotating at a constant speed you need to throw it in the air in such a way that the fidget spinner flips and you hold it back at the middle bearing when it falls back. The trick looks pretty amazing when you do it right and might take a little bit of practice but it is totally worth it. This trick can be a little difficult in comparison to the others that we have seen in the list. In this case, you need to first start with spinning the fidget spinner by keeping it balanced with the thumb and the index finger. Once the fidget spinner starts spinning, you need to balance it on your finger and then after a while, flip it in the air and balance back again but this time on the middle finger. Keep repeating this process on all your fingers completing the trick. This trick is definitely the most difficult trick on the list but you will definitely master it with some practice. In this trick, you start off by doing the convertible where you hold the middle bearing of the fidget spinner with your thumb and your middle finger. Once the spinner starts rotating, you flip it at the back of your hand and then flip it back again to the convertible. While doing the process make sure that the fidget was spinning. Not many can do this trick with perfection so do not get overwhelmed if you unable to do it perfectly at your first attempt. Keep practicing and you will get it right. This is a modifies single tap trick and all you need to do is perform the single tap twice. The fidget spinner starts to loose speed once you transfer from your right hand to the left and it is going to be difficult to get this right in the first attempt. The double tap might take several attempts but it definitely looks amazing once you get it right. This is a modified X leapfrog where once when you reach your pinky finger you try to flip the fidget spinner back to the index finger and continue the process. This trick initially feels like it will take forever to master it but once you master the X leapfrog it can get relatively easier to get this one right. This is a very simple trick in comparison to the rest and all you need to do here is first get started by spinning the spinner and holding the middle bearing with your thumb and your middle finger. Make sure there is some space between your left and your right hand and now, toss the spinner to the other hand and the idea here is to catch it without the stopping the spin on the fidget spinner. Even though it may sound simple but if you are a beginner this trick will take some practice and time to get to perfection. So, do not give up and just keep trying. You need two spinners to do this trick and start off by spinning them on each of your hands. Create some distance between your left and right hands and at the same time toss the spinner from one hand to another and vice versa. You need to catch the spinner without disrupting their spin which can be tricky. Try doing the exchange more than once, however, the spin would slow down every time you do it so you can try as long as the spinning motion does not stop. These fidget spinner tricks are easy to master and once you have got a grasp of them, you can move on to perform more advanced tricks. There are so many instructional videos on the web of fidget spinner users testing their hands at some tricks — even the more advanced tricks. Let’s wrap things up by providing a link to a youtube video showing a user performing advanced fidget spinner tricks. Have fun with your spinner toys!